Hello everyone. I hope your week is off to a great start. If you are here for the first time, welcome! I am glad you are here. Fall is my favorite time of the year for decorating our home. I love filling our home with autumnal textures and colors. But with temps still in the high 90's, fall decorating takes a back seat in my to do list. Truth is, full on fall decor happens sometime in September. 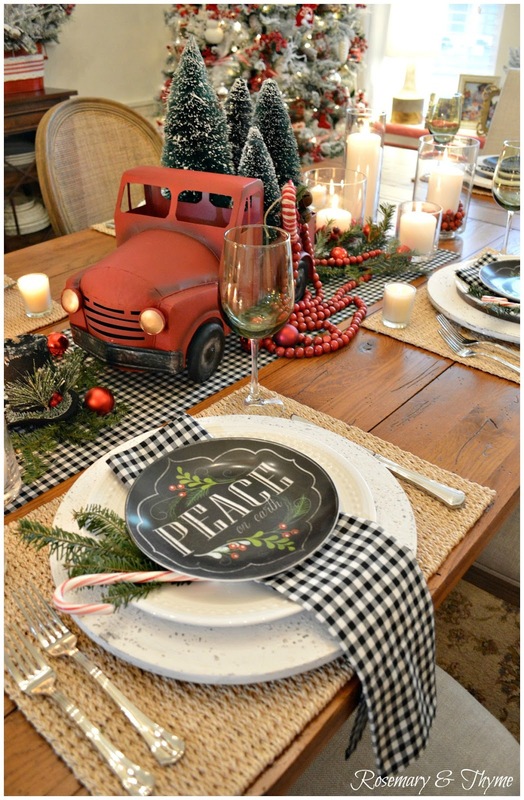 But as all bloggers know, seasonal decorating happens much earlier in Blogland. Today, I am excited to be joining a group of blogging friends for the "Transitioning From Summer To Fall Home Tours" hosted by Amber Lyon Ferguson of Follow The Yellow Brick Home to share inspiration and simple ideas that you can incorporate to your decor for a subtle transitioning into fall. So sit back, relax, and grab a glass of wine or a cup of tea and enjoy the tours. Let's first head to our sun room or as I call it, our breakfast room. This room had a makeover last year. It was originally a dark taupe with dark furniture and popcorn ceiling! 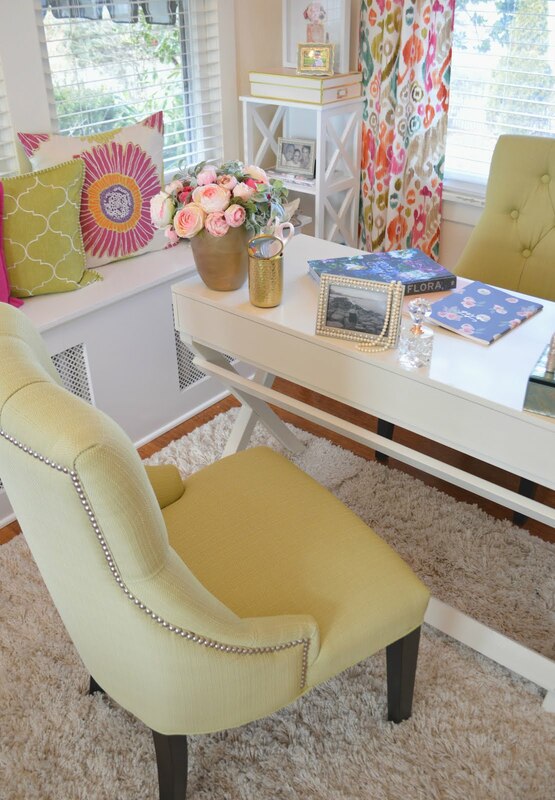 After a much needed room re-do, it has easily become on our our favorite rooms in the house. 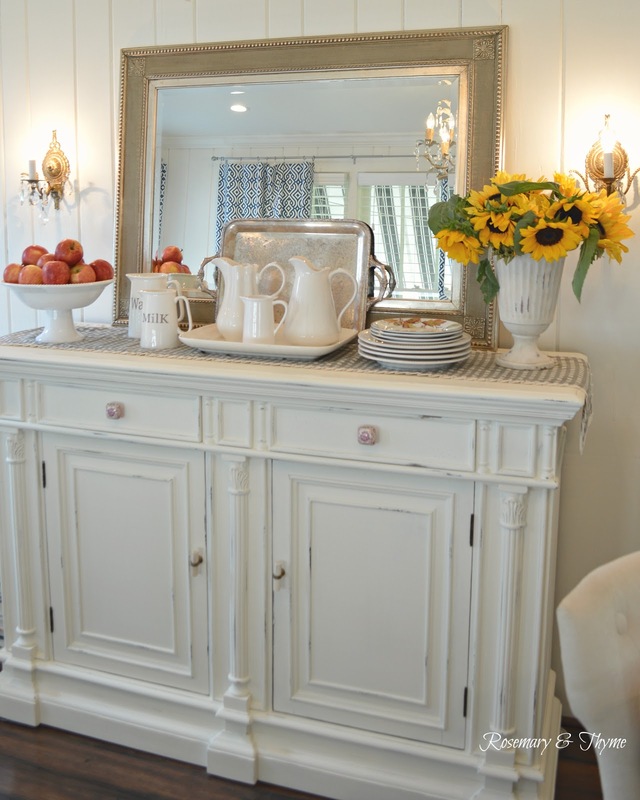 The walls and furniture were painted in a light antique white color and the difference has been incredible. It feels so much lighter and welcoming. 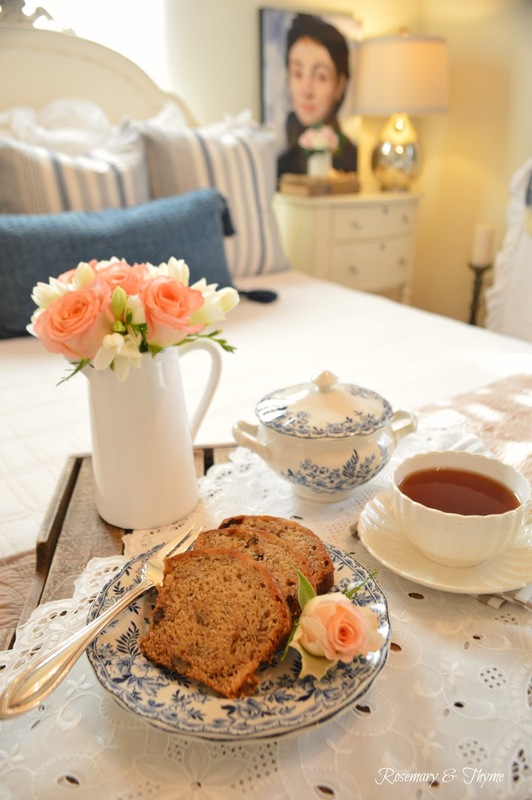 If is my go to room now for serving an afternoon snack or tea. 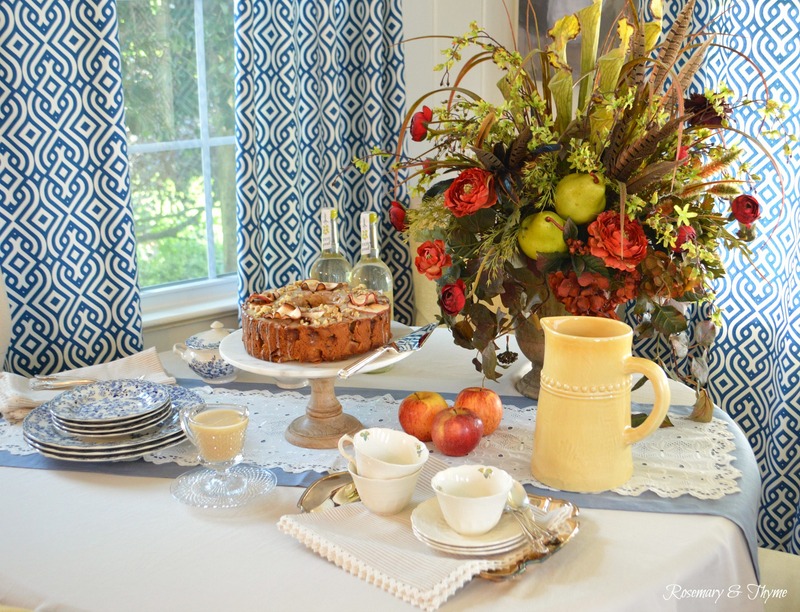 Since the room is decorated with blue and yellow, transitioning the room into fall is just a matter of adding a few simple details such as decorative pillows, throws and a large floral arrangement that I made a few years ago. An apple cake is always a sure sign of fall and this one is a must. If you are interested in the recipe, click on the link here. 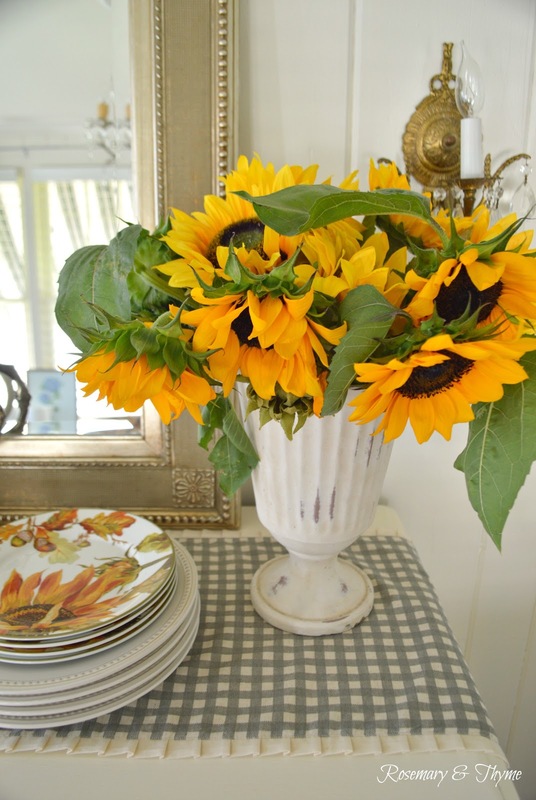 Sunflowers are also a sign of fall and our local farmers have plenty this time of the year. A weekly trip to our local stands is always a must. It supports our local farmers and I have fresh flowers all week for a fraction of the cost! Isn't this flower farm stand adorable? This is where my sunflowers come from. Just a few minutes from our home! 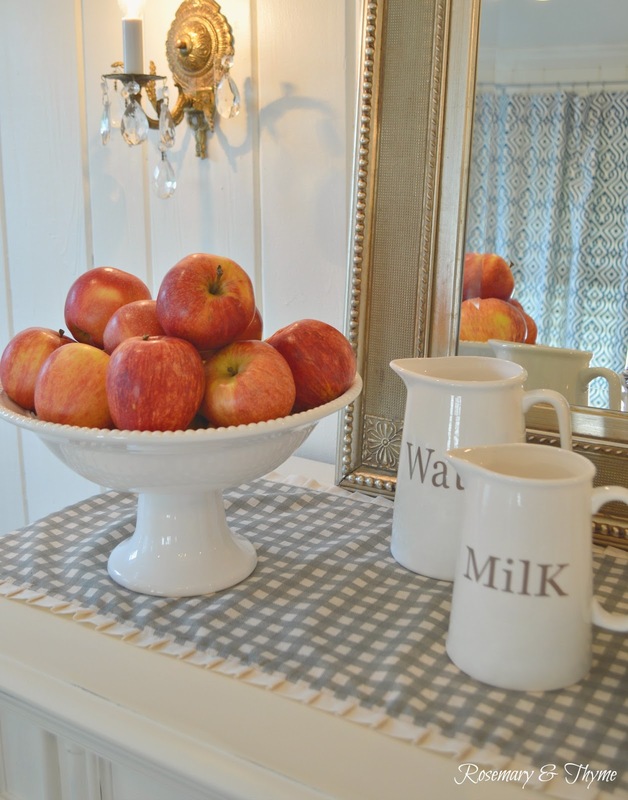 Fresh apples also great for decorating! Especially during the autumn season. Don't look at apples just for baking, use them for adding color and a natural element to your decor. Pitchers are a great addition to any style of decorating. 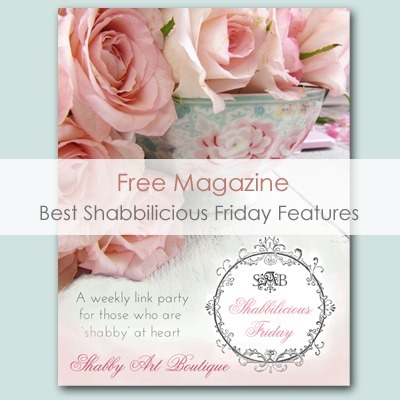 They are inexpensive and can be used all year. I just love they were they look in this vignette. 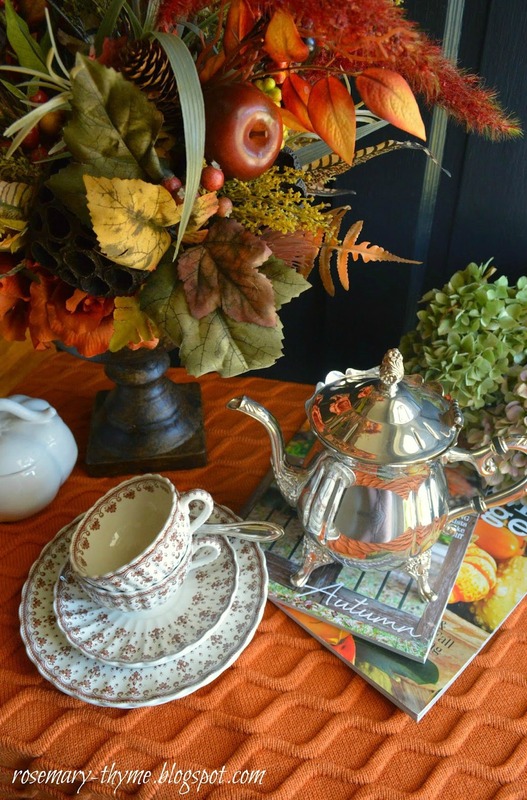 A few simple accessories can add a fall feel to your home without much effort. 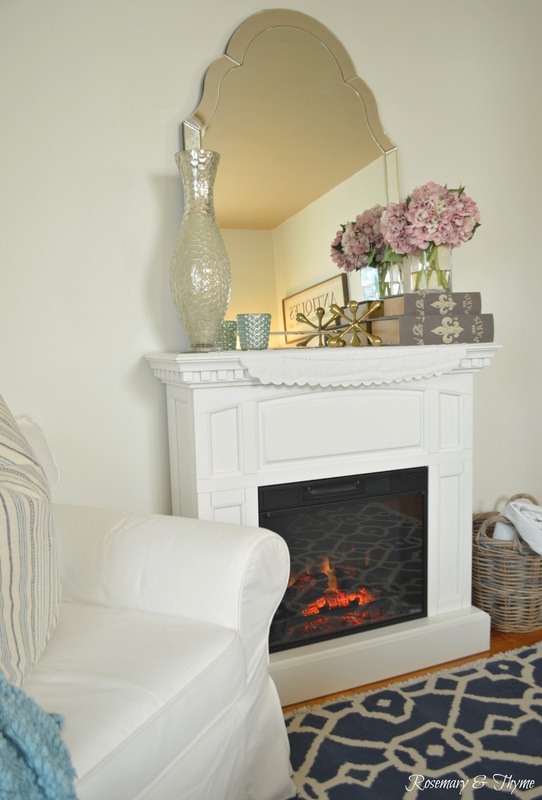 My goal is always to make guests feel welcomed by creating a room that feels warm and cozy. This is particularly of importance during the cold winter months. Once that crisp autumn air sets in, I like to add lots of throws, warm blankets and candles to the rooms. 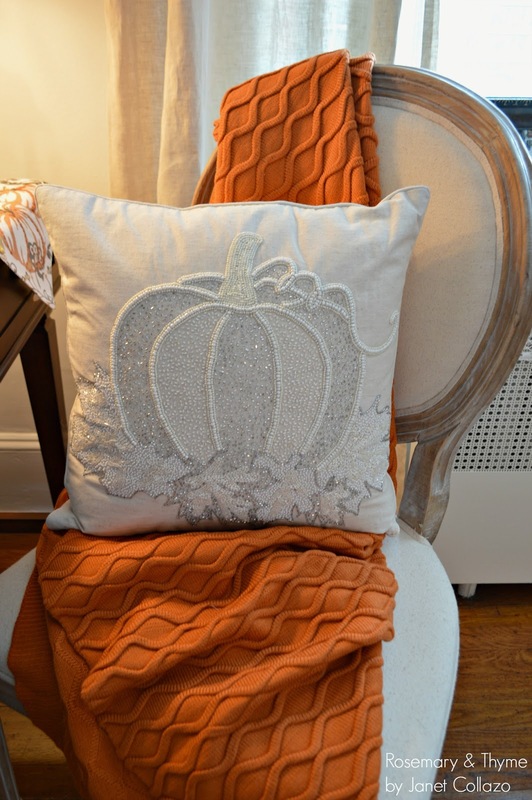 A few soft colored autumn themed pillows bring a bit of the fall flair without feeling overdone. Sometimes, when I want my guests to feel extra special, I will set-up an afternoon snack in the room for them. I know if may seem over the top, but nothing makes me happier. It is a simple courtesy that will make anyone's day. And the ultimate fall indulgence!!! A cozy seat by the fire. 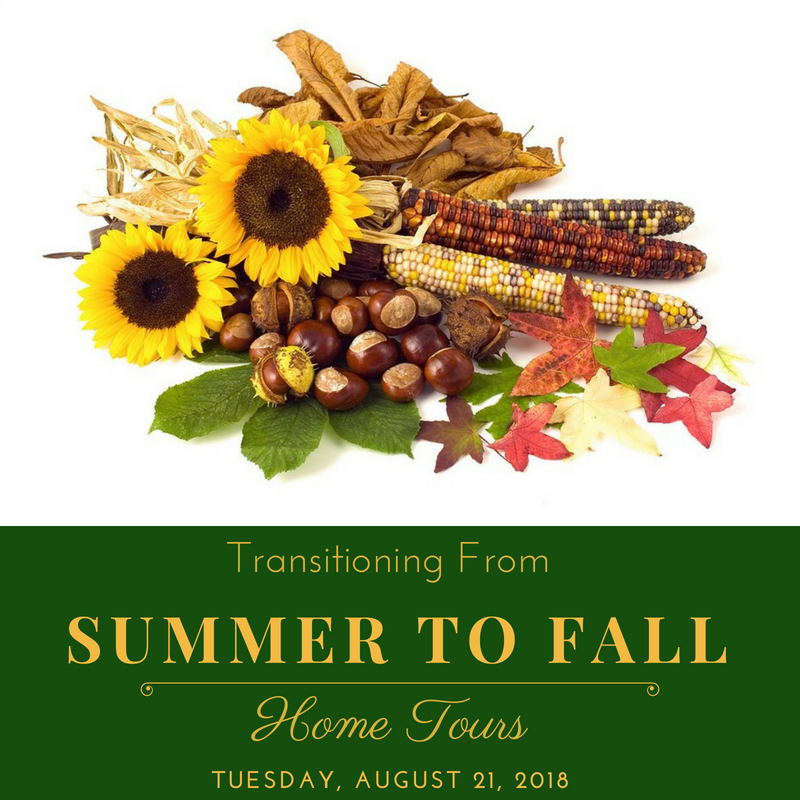 This concludes my "Transitioning From Summer To Fall Home Tour" friends. I hope you have picked up an idea or two for decorating your home this fall season. 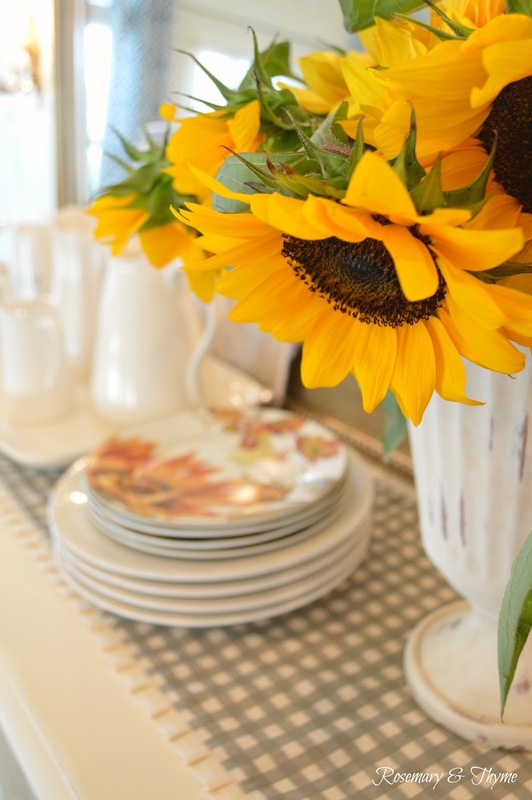 Now be sure to visit the rest of the homes on the tour for more fall inspiration. Links are below. A big thank you to Amber for putting this Fall Home Tour together. Janet your fall tour is absolutely enchanting. I love all of your soft floral touches. Thank you for visiting me today. I appreciate your kind words. It is comments like yours that make my day. It was fun joining you on this Home Tour. Your home is just beautiful, Janet! So cozy and welcoming...I just love it! Thank you for visiting me today. I so appreciate your kind words. Hi Janet, I am new to your blog and happy to discover a new friend to follow. Your early fall touches are wonderful. Yes, the flower cart is lovely. I can envision it filled with mums in all their beauty and fall colors. Hello Cindy and welcome. I am so glad you found me. Thank you for visiting me today. I appreciate your kind words. It truly made my day. Gorgeous tour, so many beautiful touches of Fall. 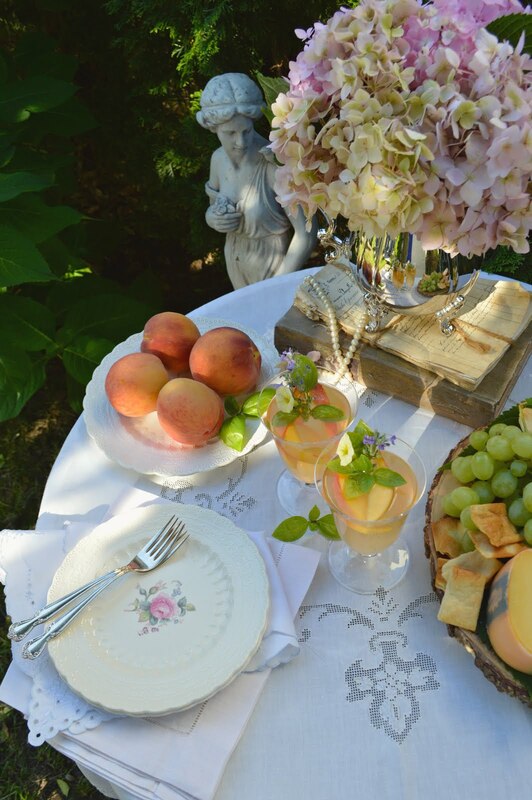 I especially love your beautiful table setting, the sunflowers are amazing and that Apple cake has me so hungry. PS, the cake is delicious. I hope you give it a try. Janet, what a wonderful welcoming home you have made for anyone to come and visit! 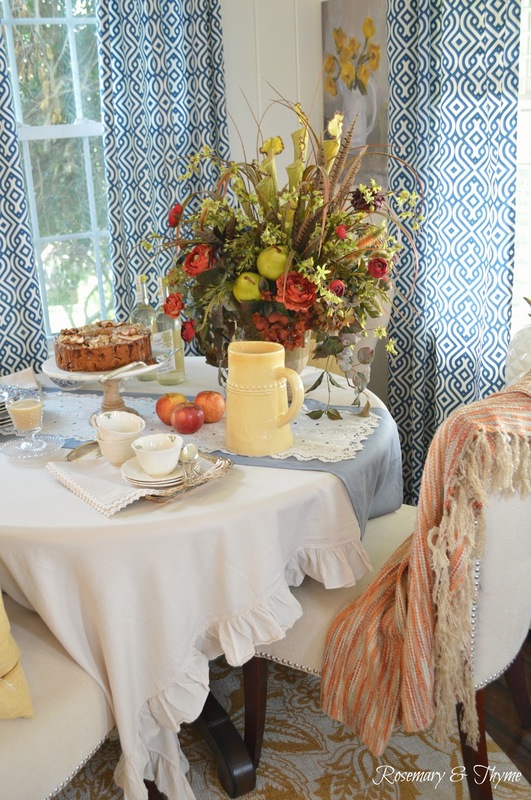 The arrangement on your breakfast table is beautiful and certainly is all that fall encompasses! How lovely that you are able to get farm fresh flowers from right down the road, what a cute little cart to pick your blossoms from! 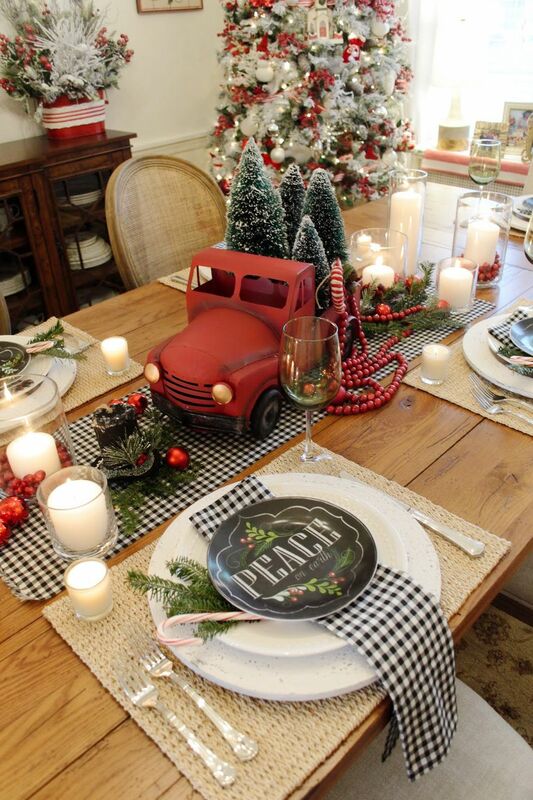 First that arrangement on your breakfast table is just stunning! 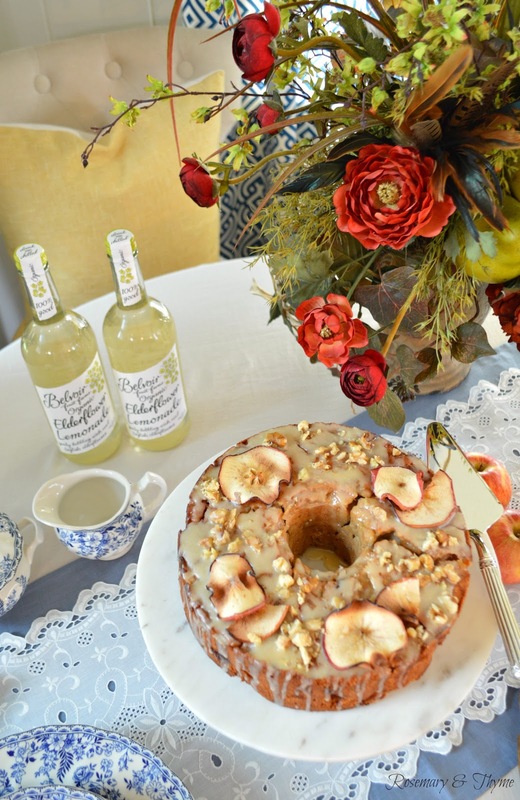 The apple cake looks scrumptious - I would love some with my pumpkin spice tea! The guest room is so welcoming and the place you get flowers is so cute! Thank you for visiting me today sweet friend. 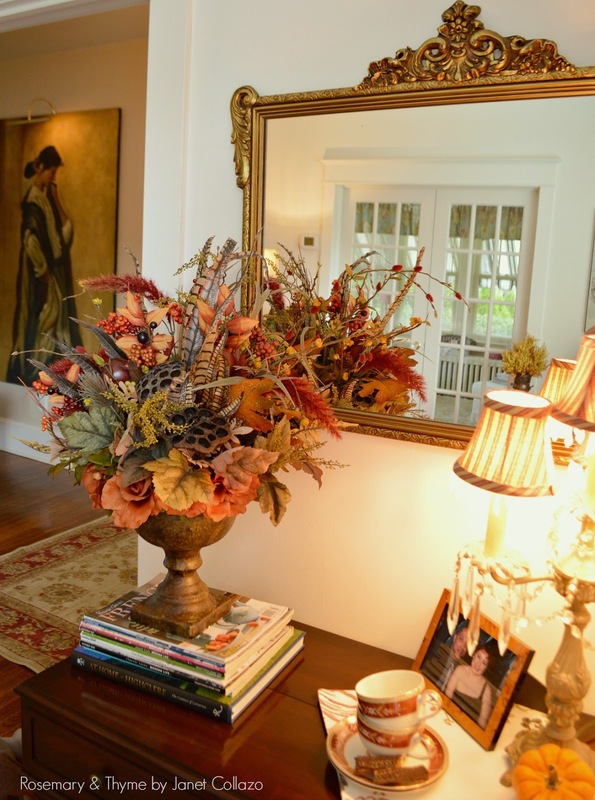 The floral arrangement is one that I made a few years ago and it's still a favorite piece of decor for the autumn season. The cake is delicious so I do hope you give the recipe a try. I appreciate your kind words. It truly made my day. It was fun joining you on this Home Tour. PS, the cake is delicious. I hope you give it a try. It was fun joining you on this Home Tour. Stunning! I will be back to comment more later!!! Thank you. Glad you enjoyed my home tour. Oh, Janet. These photos are amazing, as is your home. 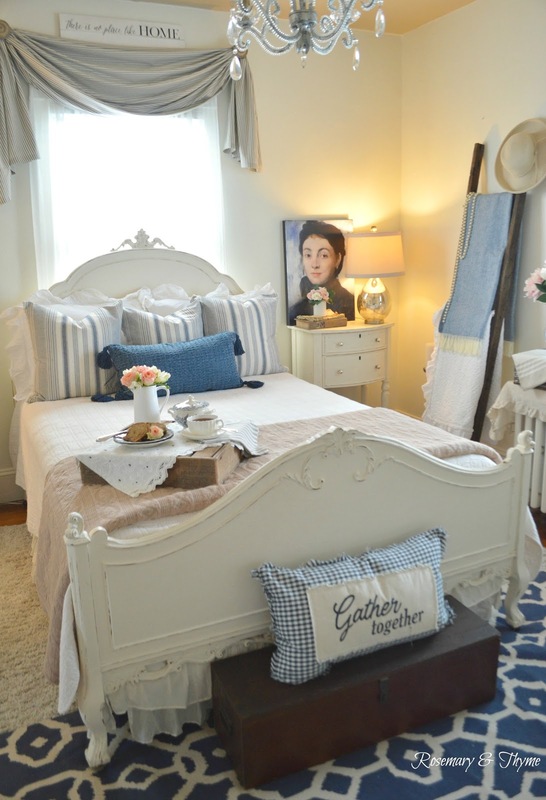 The furniture in the guest bedroom is gorgeous as is the antique white sideboard. I am intrigued by the Elderflower Lemonade and have jotted that down to look up later. My first thought was that cooked down, it might be a lovely sauce for gingerbread. I love your blue and white dishes. I know I always ask you to ID the table settings so here I am again about the blue and white. I live the denseness of the pattern, you also showed some white plates recently that seemed to have “fluted” edges. I loved them also. If you were closer to me here in PA I would suggest you consider being included in the various seasonal home tours conducted nearby. We also used to have garden tours in Bucks County many years ago (about 20) and from what you have shared, your gardens would be a welcome addition. Since I know you love the visual, let me share the name of one man whose home was on the last tour I attended. His name is Derek Fell and he is a horticultural photographer. 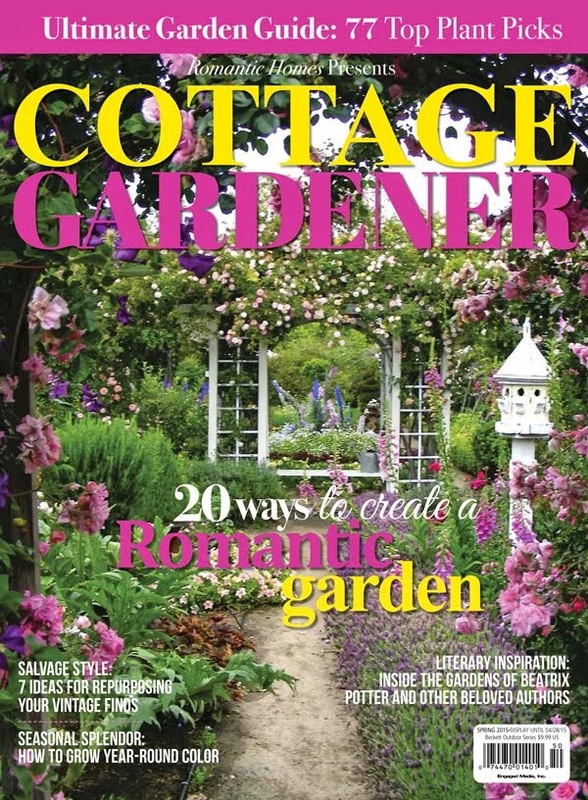 He has written many books with magnificent photos of various gardens in Bucks and Montgomery counties. 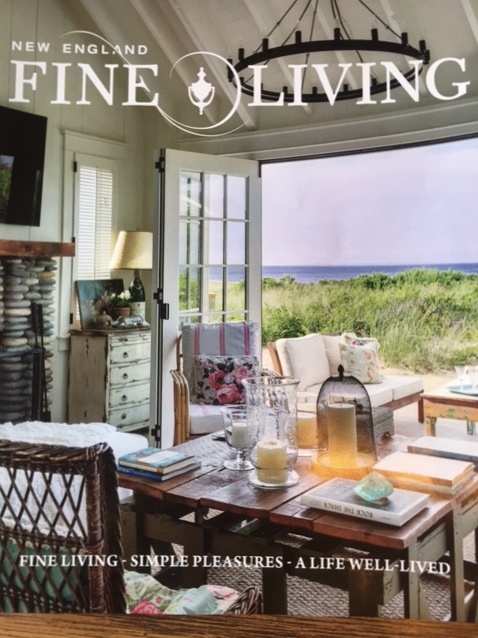 Cedar Ridge Farm is no longer owned by him and his wife as they have moved to Florida but his books will give you an idea of some of our beautiful local gardens. Have you ever been to Longwood Gardens in PA? I do not know how faring NJ you are from me but it would be worth the trip, in each and every season. I am sure you would enjoy it. Again, my thanks for all the inspiration you so generously share, and for welcoming all of us into your beautiful home through your photos. How wonderful of you to stop by for my fall home tour! I am flattered and touched by your sweet and kind words. It means so much to me. The Elderflower Lemonade is from Trader Joe's. It is lovely and I love your idea about cooking it down for a sauce. Let me know if you eve do. The blue and white dishes are Johnson Brothers and the pattern is called Devon Cottage. It is gorgeous!! 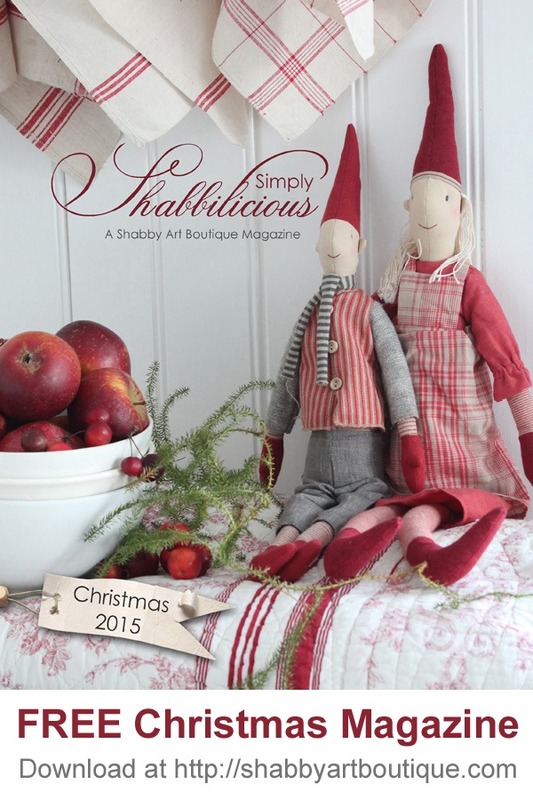 Especially is you love the English Country Cottage style. I am about 35 to 40 minutes from PA. I would to visit love gardens in Bucks County. I visit Longwood Gardens often as well as the mansions in Delaware. They are all breathtaking and inspiring. I haven't heard of Derek Fell but I am definitely going to do the research on his work. Thank you for the recommendation. It is my pleasure Nancy. Do know that I appreciate sweet words. They truly make me happy. Janet, this is all truly exceptionally pretty. I just love the way you combined colors in this post. The curtains and pillow combined with pops of fall are just perfect! I'd love to know where you got the pillow. Thank you for visiting me today. So glad you enjoyed the tour. I appreciate your kind words. The pillow is from Home Goods. Very pretty! I especially like the way you decorated your buffet. Nicely balanced! I’m decorating a lot more with neutrals so that transitioning is much easier fr9m season to season. Wish I’d thought to do that long ago...could’ve saved myself a lot of time, troubles, and moolah!!! I decorate a lot with pitchers and teapots in the kitchen. No reason they can’t spill over into the dining room! Thank you for stopping by for my fall home tour. I am glad you joined me for the fun. Using neutrals keeps things simple and easy. A few seasonal pieces makes transitioning super quick. I particularly enjoy using natural elements to decorate. And pitchers are a must!! They are very versatile. Happy fall decorating sweet friend!! Have a great week. Thank you for stopping by for my fall home tour. I am glad you joined me for the fun. Happy fall decorating!! Have a great week. I would be at the flower stand buying flowers every week. Your sunflowers from there are stunning. Your apple cake looks scrumptious and MOIST. I love a yummy moist cake. 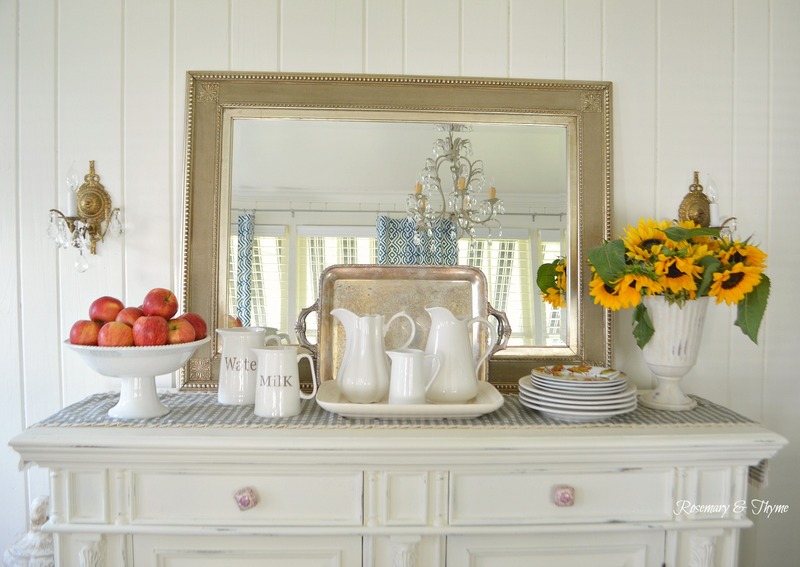 You have such a great eye for creating arrangements, like on your buffet. I will be studying it in detail to take in all the artistry in its design. Plus, your photography is excellent and pops off the page. 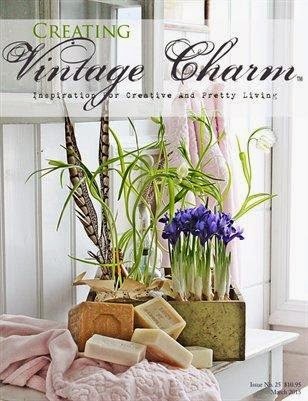 I love every vignette in your home! It all looks so beautiful. Makes me want to come visit and hang out there. Very welcoming. Great to be on the tour with you too! Sweet Janet, I don't know where to begin....everything is so beautiful and oh, your home is ever so charming! I love all of the fall touches that you've added to each room. Stunning, my friend, just stunning! 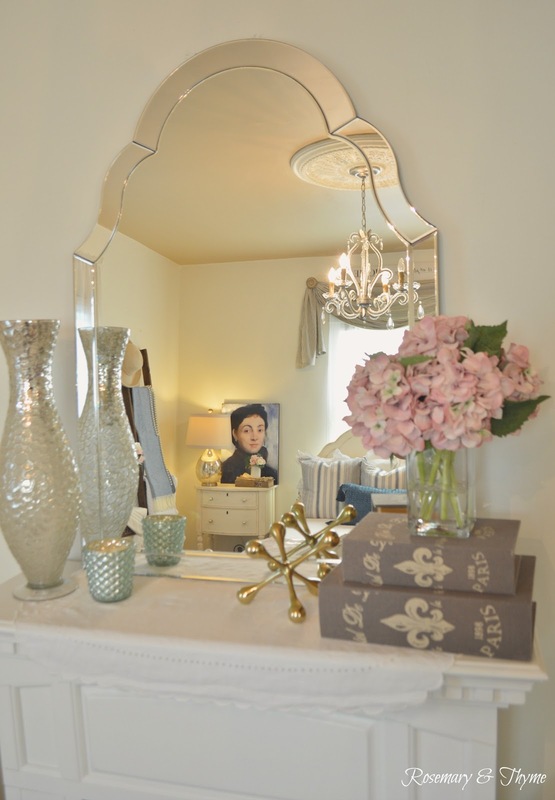 I am delighted by your visit and happy that you stopped for the home tour. Thank you for the kind words sweet friend. It means so much to me. Do know that I appreciate every word. Wishing you a blessed week. 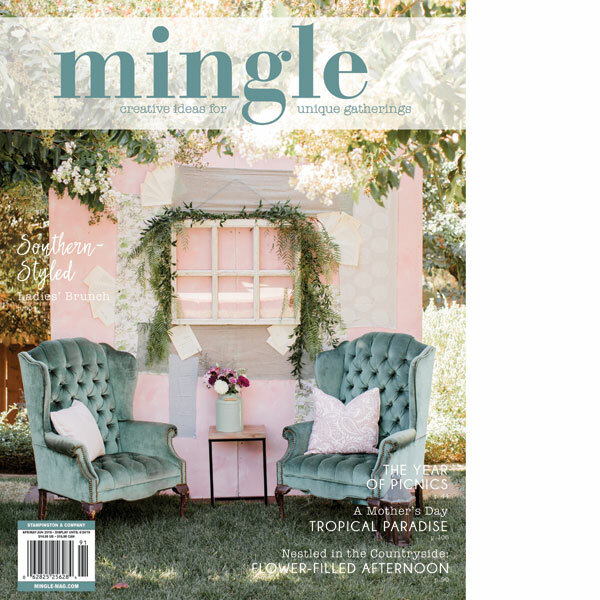 Your tablescape is so pretty but the cake looks fabulous!! Love your tour! Thank you for stopping by for my fall home tour. I am you glad you joined me for the fun. I do agree, the cake is fabulous and delicious.!!! Have a great week. Janet, Your home is lovely! The combo of sunflowers and apples with your white pitchers is perfect! I can see why your guest room is popular; very inviting! Thank you for visiting me today. I truly appreciate your sweet compliment. Wishing you a great autumn season. You have a lovely home. You are blessed and a very good decorator. I do enjoy fresh flowers in the home. We have wildflowers in the fields around us, and my daughter likes to bring them in for me. Janet, your blog is always a place for my eyes to rest on quiet beauty. 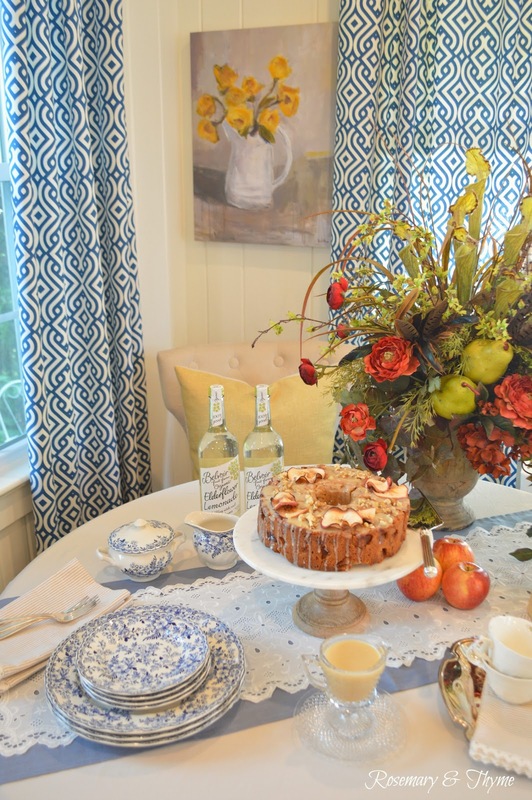 Your table settings are always that, and that apple cake for fall looks absolutely delish. Thank you for visiting me today. Your beautiful and sweet words made my day sweet friend. Janet, your home tour is amazing! 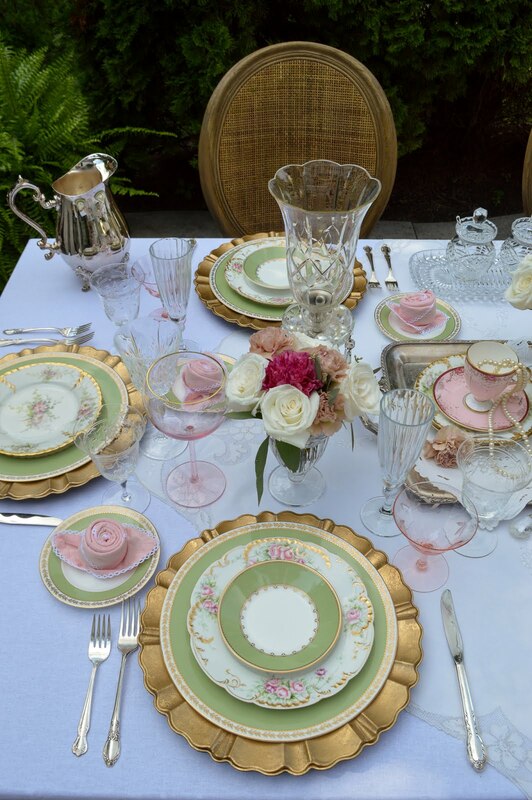 I especially love your table setting - what a perfect place to enjoy some tea and cake! So happy to be on the home tours with you! Oh my gosh, that apple cake looks absolutely amazing!!! It's almost too pretty to eat! I love all of your beautiful fall touches. So happy to join you on this tour. Thank you for visiting me today. I truly appreciate your sweet compliment. The cake is delicious!!! It was fun joining you on this Fall Home Tour. Wishing you a great autumn season. Janet this is just exceptionally magazine-worthy gorgeousness from start to finish! I love it all but my favorite is picture 11 with the vintage girl in the oval frame. I love collecting those types of pictures and paintings. I would never want to leave that room! Wow your vignettes and photography are just stunning. Thank you so much for joining our tour! I hope you have a beautiful rest of summer and fall ahead! What a gorgeous early fall tour! Your use of flowers is just perfect. The bedroom with the layering is so cozy! Thank you for visiting me today. I appreciate your kind words. Thank you for visiting me today. I appreciate your sweet compliment. How gorgeous everything looks at your house dear friend. 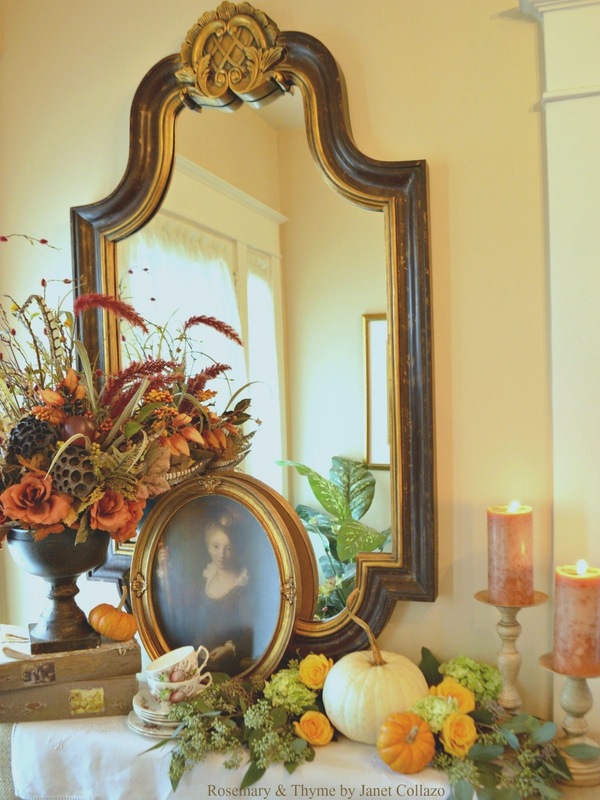 Your transition to Fall is beautiful... the flowers, the decoration, etc. I so enjoyed it. Sorry I didn't see there was a party too. Please let me know what time and when it starts. so beautiful, the cake looks delicious! 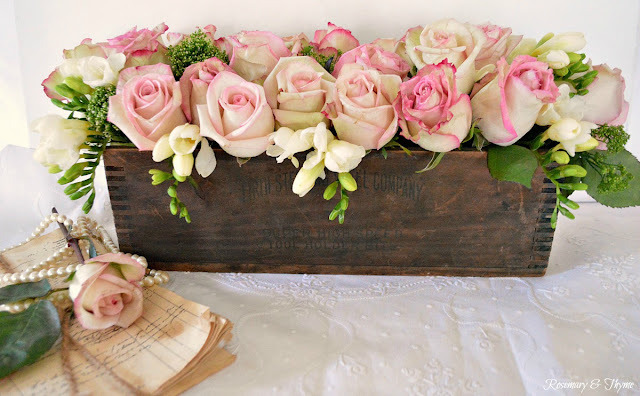 Love the flower arrangement, flowers can totally take us into the next season easily. 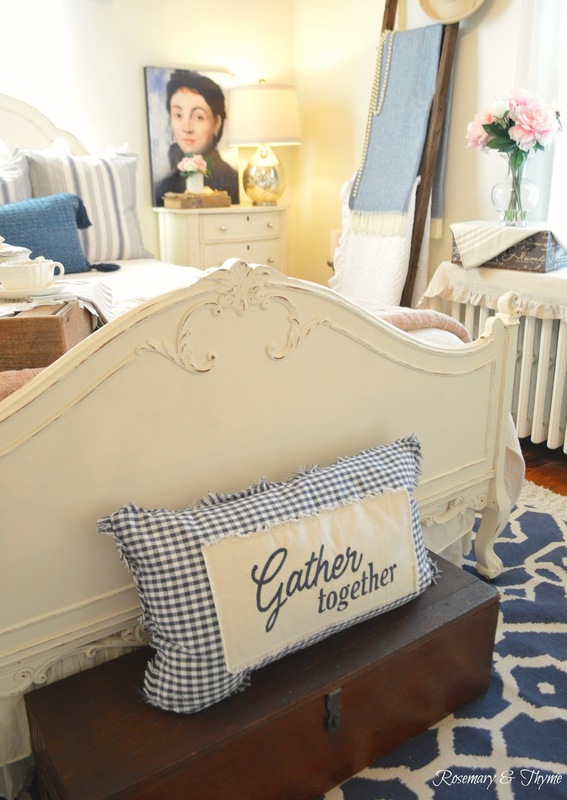 Your antique buffet and bed are just amazing!